Family video game night is a big deal around our house. We make popcorn and milk shakes. A tremendous amount of planning goes in to finding a game that the entire family wants to watch or participate in. Okay, so the kids do most of the planning, but my husband and I retain veto power. Angry Birds, Lego Star Wars and My Sims Kingdom have recently been featured in our family video game nights. 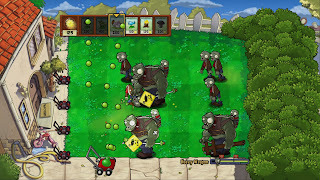 A couple weeks ago my youngest started lobbying for us to download Plants vs. Zombies to our iPhones so he could play. One of his friends at school had told him about the game. So, when I was approached to do a review of the game for the PS3, I honestly thought, I'd sit and watch the kids play a bit, then write a review about how much THEY loved the game. Um... I couldn't have been more wrong. 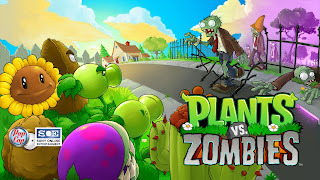 Yes, the kids LOVE the game, but after we downloaded the game from the Sony Playstation online store, it was my husband that refused to give up the controller. I think the game was being played by someone in the house for 4 hours straight as soon as we downloaded it (everyone was taking turns). Talk about addictive! It's right on par with Angry Birds and some of the other games that are hugely popular. One of the things that cracks me up the most is the "notes" that are left by the zombies with such phrases as "Please leave your doors unlocked and yard unguarded". The notes really crack me up. It's pretty lighthearted so you don't have to worry about it being inappropriate for younger kids as they simply won't get the meaning of Zombies in this colorful cartoonish game. What I love about this game is it forces you to build strategy, quick thinking skills and is just plain fun for the family to do together. I should also point out that within two weeks of release on the Playstation Network, this game was already a top new release with an average rating of 4.86 stars out of 5. Note it currently costs $14.99 on the Playstation Network (but is still well below the cost of most video games). I love how you can download the game instantly and don't have to head out to a store to buy it!